Lucky Reptile Coco Planters are made from 100% natural products, without chemicals or pesticides. The planters are made of coco fibres and natural gum is used as the adhesive. 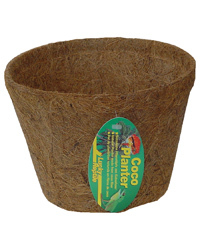 The advantage of these coco fibre planters is, that the roots of the plants can grow together with the fibres. If the planter finally gets too small for the plant, both plant and coco fibre planter can be transferred into a larger planter. Lucky Reptile Coco Planters can be used for terrariums, aquariums, ponds and also as a regular planter for your home and garden.